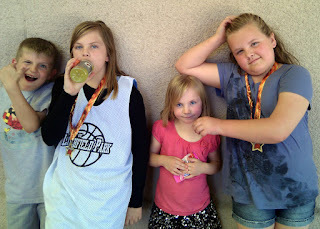 It was the girls' basket ball tournament today. Their team won the championship. Dalan's team won the week before. I never was able to see him play in a game this year. They get a pizza party at Peter Piper Pizza for being champs. Way to go, guys! YAY!! Great job girls!!! Wish I could have been there to see their game! !